Try Speciality Coffee in Oakham! It’s happy dances all-round here at Two Chimps Coffee. Two of our hand roasted speciality coffees have been selected by a beautiful, boutique hair salon. So now you can try speciality coffee in Oakham whilst having your hair done. Hannah Coxhead Hair Studio is smack bang in the middle of Oakham and their totally awesome, homely hair salon is an excellent place to sit back and relax. Hannah and her team care for each customer like a member of the family. 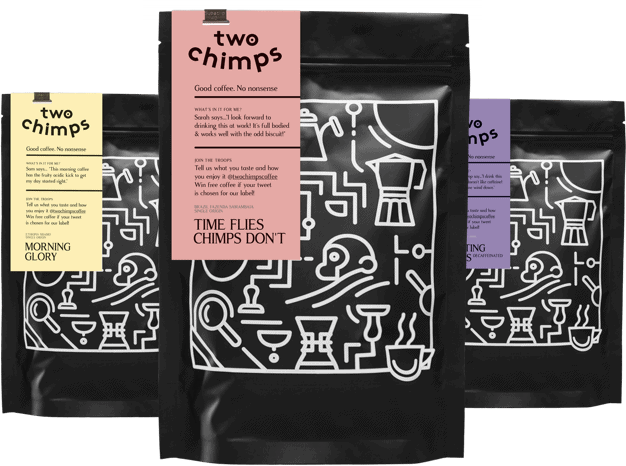 Their unique customer experience includes freshly brewed tea leaves, cooled water tinted with all sorts of fruits and… you guessed it- Two Chimps Coffee! Hannah brews her coffee through a filter and serves it in Chemex coffee pourers. Currently, you can enjoy a speciality coffee from Mexico – ‘Not Going Right? Go Left’, or a fab Rwandan ‘Knickers & Gnomes – Decaffeinated’ coffee. As all of our coffees are seasonal, they will change. However, we will always give the team a similar tasting yummy coffee to wow their customers! Now added to their extensive drinks menu, Hannah Coxhead Hair Studio offers espresso martinis! These are served all day and are freshly made by one of the team while you wait. The espresso is brewed using a Handpresso. This device doesn’t use any electricity because, as it says in the name, you use your hand to build up enough pressure to brew your espresso. Ideal for the planet. Don’t worry if you are driving and are craving an espresso martini. Hannah also makes these cocktails using smaller quantities so everyone can enjoy one. Nice one Hannah! If you arrive home and you are thinking to yourself “hmm, I wonder how you make an espresso martini” then look no further. Check out our blog where you will find a step by step guide on how to make your very own. We deliver hand roasted coffee every week to the salon to ensure Hannah and her customers drink only the freshest coffee. So if you are looking for a chance to relax, unwind, be pampered and enjoy a cup of freshly brewed Two Chimps Coffee – look no further. Give the team at Hannah Coxhead Hair Studio a call on 01572 755 501. So there we have it, Two Chimps reporting at Hannah Coxhead Hair Studio. We are feeling refreshed with all fur washed and blow dried- Over and Out! Finally, do want to know where else you can try Two Chimps Coffee ?